Evoke the wildness within by wearing a horned headdress of your own making! We’ve been making horned headdresses of all sizes by commission and for our shop for many years, but now we are making an online course to teach YOU how to do it! This is the most requested tutorial by students and fans and we are glad to finally be able to offer it. We started shooting three days ago. Will wrap it next week and then go on to editing, graphics, and written materials. The online course will include seven videos, supply lists with international sources, step summaries, tips, and bonus goodies. It will be ready for you to dive in on December 1 or soon after. 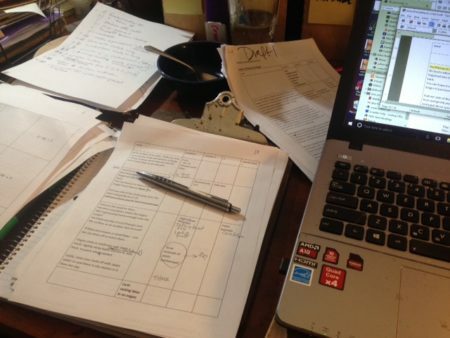 Many revisions are required to get the information out as clearly as we can! It builds upon and frequently references the skills taught in The Introduction to the Organic Armor Arts course we launched two years ago. 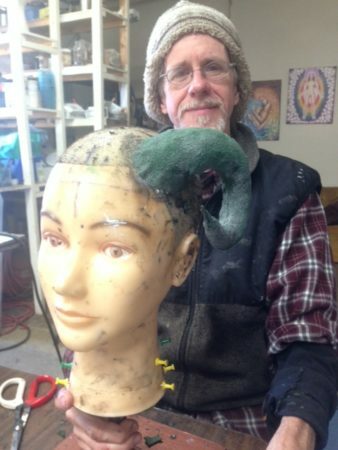 You will need to know what’s in the Intro course to do the Horned Headdress course. For that reason we are only selling the course in a package with the Intro course. The regular price will be 300.00 but it will be on sale at a discount on Cyber Monday. If you are a newsletter subscriber (sign up in footer), you will get a little early bird access with an even bigger discount. If you are already a participant in the Intro course you can buy the new course separately. Watch for a student newsletter announcing this next week. 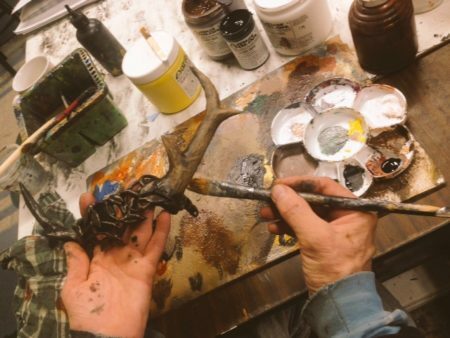 The course includes oogoo moldmaking, antlers and curled horn making, building a base, and two new painting techniques. The content is available 24/7 and can all be accessed as often as you want, forever. Watch for more announcements soon! For horn-y inspiration see this gallery and this one. We also have a pinterest board of horned headwear from many artists and animals.